Apple and Amazon today announced that Apple Music will launch on Echo devices beginning the week of December 17. 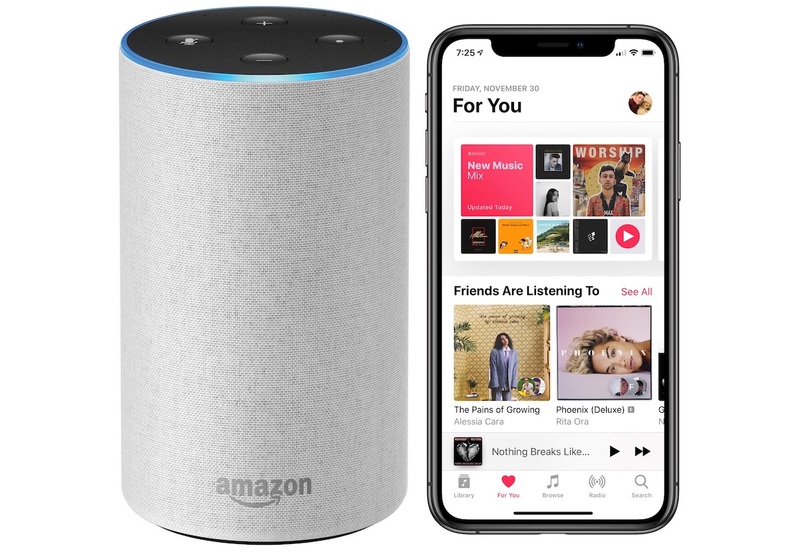 In a blog post, Amazon explains that Apple Music subscribers will be able to ask Alexa to play their favorite songs, artist, playlists, Beats1 radio stations, and albums, all through an Echo speaker. One example they give is the command, "Alexa, play Bebe Rexha on Apple Music." Apple Music is said to have over 56 million total subscribers, including those on the free trial. The company is in a battle with Spotify as each tries to grow their numbers. In November, Spotify reported 87 million paid subscribers on its service, and 191 million monthly active users. These numbers refer to global paid subscriber users, and in a report over the summer it was suggested that Apple Music is actually ahead of Spotify's paid subscriber count in the United States. Both Apple Music and Spotify were said to have more than 20 million paid subscribers in the U.S. as of July 2018, and at the time Apple was "a hair ahead" of its rival. I literally just checked outside to see if the sky was falling. Still amazes me that people are happy to have these 'smart' speakers in their homes. Who really trusts the likes of Amazon & particularly Google with your data & privacy? Not me. Overall, great move for Apple Music as a service being on more devices. From a hardware perspective, bad news for HomePod. Personally, I do not care if it listens to my conversations. I am not doing anything illegal. Makes me assume that HomePod sales must be lacking and this is their response to stay relative. It was probably part of the agreement with Amazon starting to sell Apple Products again. edit: Just to be clear I know people are concerned with privacy and not just doing "illegal" things. I just flat out do not care if it listens to my conversations. The same way I still use google services because I do not wear a tin hat. I think the argument "I am not doing anything illegal" so let them spy, doesn't hold anymore. And I am really not the kind of guy who gets paranoid with data and privacy concerns. YES!!!! I have a number of Alexa devices, and refuse to pay Apple's ridiculous price for HomePod, but I find Prime Music to be lacking (I'm an Apple Music subscriber). This is awesome! Yeah, it does not bother me to be honest.